I end up playing a lot of this game at my local Viejas Casino, mostly because it’s a really cheap game if you stick to the just Ante bet (~1.5% house edge). Of course, everyone else plays the Aces Up and Two-Way Bad Beat Bonuses, and you pretty much get ostracised from the table for not betting them. The other players just shake their head at you, and g-d forbid you should lose with a bad beat without betting the bonus. I don’t know where else you’ll ever experience such negative communal disapproval. It’s about as bad when you hit your 12-15 against a dealer 6 upcard in Spanish 21 (you should). On 3rd base. Every hand. Anyway, everyone just loves the Two-Way Bad Beat Bonus. They don’t care what the house edge is. That’s why they’re there. They just want to hit a 35:1 or higher payout. And it happens frequently enough, especially when you play it every day. It’s the crack cocaine of bonus bets. 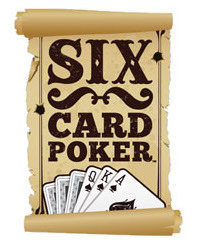 Some readers asked about a Baccarat side bet called “Super Six” which pays 15:1 for a dealer wins with a 6 total. It’s really easy to analyze the countability of any Baccarat side bet. The ideal return for this bet with a perfect (computer) count of an 8-deck shoe game with 15 cards behind the cut is only +24% of a fixed bet per shoe (2.6 bets per shoe at an average +9.2% advantage per bet). A simple unbalanced count (six => -2, seven, eight, nine => +1) and betting when the running count is +34 or higher yields only +12.2% of a fixed bet per shoe on 2.77 bets/shoe, and +4.41% edge/bet. It really doesn’t seem worth the effort, even if you had an ideal count (e.g., mobile app). You’d go crazy waiting around for less than 3 bets per shoe. You probably know that I’m not much into advantage play based on edge-sorting cards. That’s the realm of Phil Ivey and Eliot Jacobson. It’s a pretty cool technique, but it’s way too involved for my attention span, regardless of the payoff. However, I did watch Warren Beatty in Kaleidescope, if that counts for anything. Anyways, a reader who saw Eliot’s post on Edge Sorting (Jacks in) Mississippi Stud asked me if it’d be worthwhile to also sort the Queens, Kings, and Aces. That’s a pretty interesting question, since I can see how Eliot would start out with just the Jacks, as you’d know when you had a sure winner. But, maybe sorting the other “pay” cards would improve the return. You might not know exactly when you had a winner, but you’d have a good idea, and much more often. So it’s probably worthwhile to sort all the “pay” cards, unless it really complicates the practical strategy (not too likely).